Designing is an exciting experience, especially when you’re fortunate enough to have one of your designs published by a company! I’m honored to be a part of the Scarves, Etc. 7, 2018 collection from Quince & Co. This was my first time submitting a design for a company, and to be chosen by one of my favorites, is a dream come true. So, for this second journal entry, I decided it would be relevant to share the making of this design and how it all came together. Lake Superior is a design that I’ve been working on for quite some time. I began this idea while working from a pattern that I knit a few of years back; I was intrigued by the foundation of the piece but found that many aspects were not quite right for me. Over time, and many completed cowls later, I found a balance between size and shape, and, once the idea was submitted to Quince, made the final edits to for the overall inspiration and design. 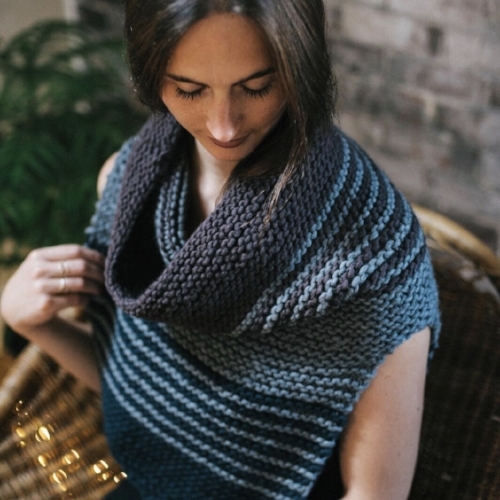 My work is simple, and the Lake Superior cowl is a cumulation of everything that I love in a knitwear design from an easy knitting technique to its structured shape. Firstly, the inspiration. To those of you who know me, it should come as no surprise that my first design on the market is named and inspired by the place that inspires me the most. I am fortunate to live and work near Lake Superior and have spent countless hours of my life combing the shores for rocks and driftwood, swimming in its cold, crisp waters, photographing and admiring sunrises + sunsets, and ferrying to Madeline Island, but mostly, I can sit for hours looking and steadily admiring this fresh water ocean. The shape of Lake Superior often finds its way into my designs, and I find myself striving to alter the form in new ways and to use new materials. It’s a place to be respected and a place to be protected, and with each visit, I find that it brings forth new ideas for my work. Therefore, on a crisp October day, after teaching fibers at the University of Wisconsin – Superior, I crossed the Blatnik Bridge from Superior to Duluth and found myself walking along the lake walk near sunset. I immediately began snapping photos of the sunset as I walked – the colors were too lovely to not try to capture. As with every Lake Superior sunset, a different color story, design, reflection, and inspiration was displayed in front of me, and I continued to enjoy the view keeping a swift pace to stay warm as the chilly wind swirled around me. The images from that sunset walk remained on my camera roll for another month before finding its place as the front runner for the making of the Lake Superior cowl. Next, when Quince made its request for submissions on Instagram, I visited a local yarn shop that carried Quince & Co. yarn to see what colors they had to offer and was fortunate to find three colors that represented the colors from that photograph I had captured on that walk along the lake. 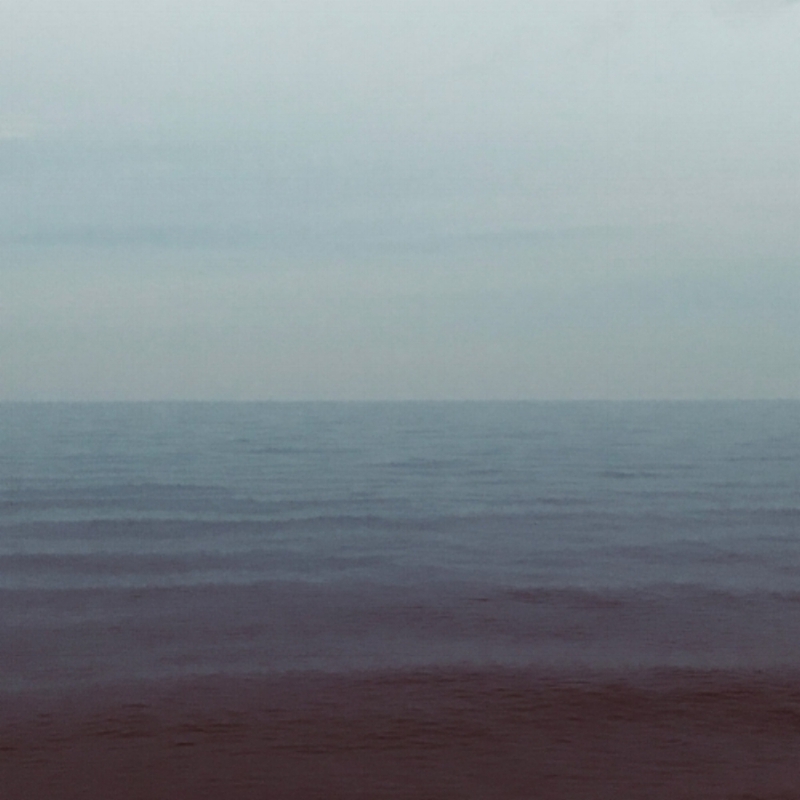 Slate for the deep dark blue of the lake, Kittywake for the grey reaching the surface of the lake to the beginning of the sky, and Damsel for the smoky lavender of the sunset sky. They couldn’t have been a better match! So, with the approval from Quince to use the colors for the design in the ever-so-soft Puffin Chunky yarn, I began to draft the pattern. Originally, the cowl had a different shape to the bottom, and after submitting the design, I began brainstorming ways to make it a bit more interesting. I started thinking of a sharper angle to the piece, and when Quince suggested the same idea after accepting the design for the book, it sealed the deal – I love when this happens! Often, when I’m coming up with an idea, I think of everything that I can about the chosen inspiration and write down words that describe it. With Lake Superior, two of the words written on the page were Sharp + Clean, and these words helped define a “sharp angle” and “clean shape” to the cowl. It’s a great technique to designing, and one that I began using while taking a design class in college. Try it the next time you need a little help directing a design – it really can help! Finally, the Lake Superior cowl needed to reflect that chilly walk along the shores of the lake. It is important to have the proper clothing when the snow flies in the cooler months of the year, and this design is a perfect layer to bring for extra warmth, under or over a jacket, while providing a clean and modern look. 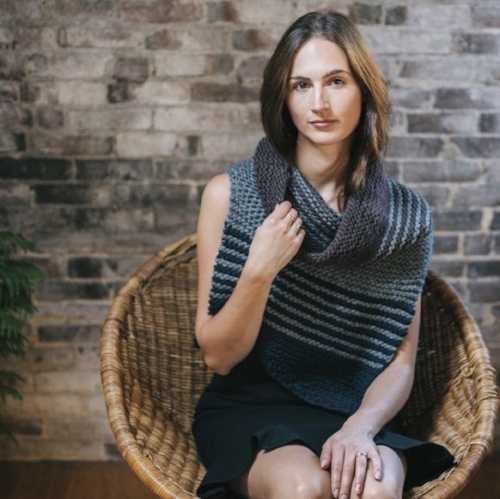 Quince & Co. are masters at styling, and their yarns are at the top of my favorites list. I knew that I wouldn’t be disappointed, and when they sent me the images from the photoshoot, I was beyond proud. The model looks like she belongs in the cowl; they brought an elegance to it with the backdrop and sleeveless black dress, and the angles and poses showcase the interesting shape of the piece. I continue to be in awe every time I share a photo of the design and am honored to have been a part of this publication. Also, I wear many color versions of this cowl a couple times a week – this is a testament to my love for this piece, and if you choose to knit one for yourself, I hope that you love it too! Welcome to Inspire • Design • Make, The Journal! Inspire • Design • Make has been a long time in the making, and I am super excited to begin this journey with each of you! For this first entry, I thought it would be right to start at the beginning. Metal + Wool is the brand; Inspire • Design • Make, is the work behind the brand. In the not so long ago past, I was fortunate enough to make a professional transition from being the General Manager of a natural foods store, a position that I held for over 13 years, to return to college to pursue an MA in Visual Arts. Though my career didn’t include my art training directly while working in the business world, I continued explore all areas of fiber; occasionally, through workshops, classes, and my own studio experimentation. This transition made way for possibilities, and in a rather short amount of time, I have found myself instructing at the university level, developing more workshops, teaching local classes, and finally, continuing to make my own designs. I love design! I live for the process, appreciate the foundations of design, and enjoy making pieces from beginning to end. It occurred to me while taking a foundations class in college that, although the class was intended to be applied to graphic designers, this method could lead to something special in any discipline, including fiber work. The class included ‘steps to creativity’, and it opened my eyes to a more structured way to developing ideas, and a process of bringing an idea through to the final product. This was a key missing from my work that opened the door to a process that works for me. It was just what I needed! My name is Denise; I am a design junkie and couldn’t be happier! So, what is this process that I speak of? How can it fit into your current design plan? For some of you, the idea may seem daunting, and indeed, this may not be for you. But, as I wrote in the preceding paragraph, this was a great discovery for me. The idea is quite simple, find and inspiration, take thoughtful steps to find ways to bring this inspiration to paper, discover ways to bring this idea from paper to sample, and finally, design the piece. It is certainly something that has been described and done before, but it’s not something that I have seen used with fibers. Now, I use this method with knit and woven pieces – along with metalwork and all other forms of fiber that I love to explore. I have a lot of inspirations, so it’s rewarding for me to thoughtfully turn these into wearable pieces. As this Journal develops over the coming months, I hope to share not only my finished work, but how everything comes together. An entry may simply be about creativity, but it may also include more concrete detail such as steps in the design process, the practice of natural dyeing, a workshop or event, or it could specifically be about inspiration. I plan to include a lot about inspiration!